We can't remember if we've blogged this classic shot of Elvis Presley on a bicycle whilst stationed in Germany with the military. Brilliant stuff. Looks like a Scwhinn - which would make sense on a US Army base. The King was one of the greatest bicyclists ever! Yes, that's a Schwinn Racer (I've got one. Nice city bike). The insignia on the downtube is the Hat in the Ring of the 94th Fighter Squadron (of Eddie Rickenbacker), but that's just coincidence as it was standard on the model. The bike is not a PX issue, but his own personal bike. He lived off base in his own apartment (not a special privilege; any serviceman could apply for that). Look under the top tube and you'll see the "Hound Dog" guitar plaque hanging from it. 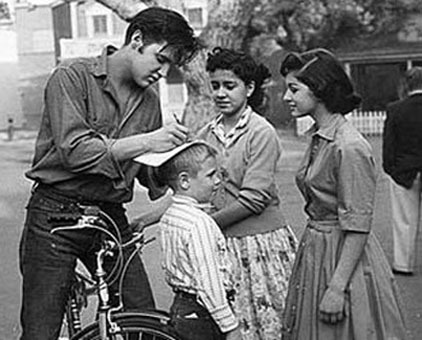 Elvis brought some of the things he especially loved to Germany; and Elvis loved bicycles. A nice photo of the one and only king of Rock and Roll! I wonder if the King would look so cool if he head a helmet on is head? No, it's Germany, all right. See the two young women from Bavaria, the boy in the traditional German garb of Levis and a cowboy shirt, and the little German cottage in the background with the white picket fence?